MUFG has been named as the winner of the Coming Force in Corporate Debt Capital Markets and Most Impressive Bank for Corporate Debt Capital Markets in Yen awards at GlobalCapital's 2017 Bond Awards. The GlobalCapital 2017 Bond Awards celebrate excellence in bond issuance, rewarding the most impressive teams and individuals in the market. The winners of each award are chosen via a poll of market participants and were revealed at a gala dinner in London on 23 May 2017. 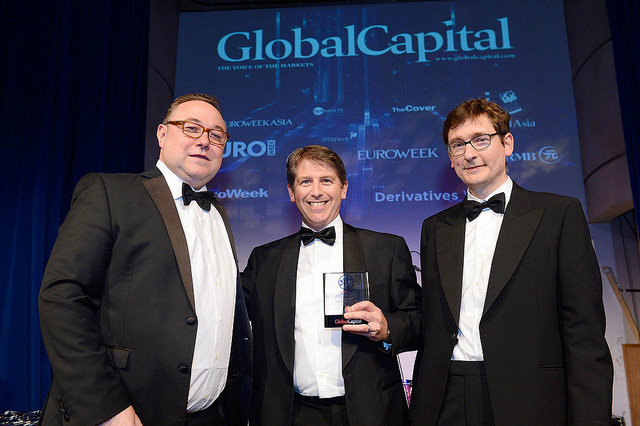 "These awards reflect the strength of MUFG's growing international capital markets franchise and we are delighted to have received this marketplace recognition, on behalf of GlobalCapital. The awards follow a highly successful period for MUFG across our global platform in US$, Euro, Sterling and Yen markets for our core clients. We are very much committed to investing in our people and in our business; adapting and organising ourselves to help our clients grow, in their own markets, and around the world." Sarwat Faruqui joined MUFG in August 2016 as Head of EMEA Syndicate and Co-Head of International Syndicate, bringing deep market knowledge and experience to our EMEA Syndicate desk with an outstanding track record and demonstrated leadership in the fixed-income primary markets.